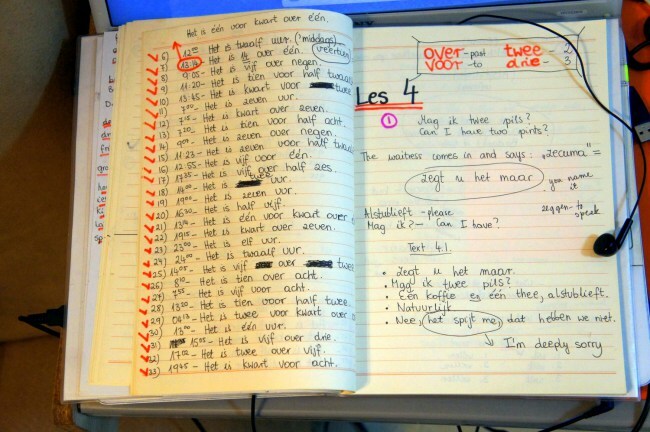 Lesson 4 – Mag ik twee pils? This lesson deals with ordering in restaurants and pubs, offering and accepting (or not accepting) drinks, and on how to say things like ‘sorry, ‘please’ and ‘thank you’ in Dutch. Furthermore, there’s some theory on small words that don’t mean anything and there are some remarks on how to behave when visiting Dutch people. In any Dutch shop, restaurant or cafe, somebody might approach you and say something that sounds like ‘zecuma‘. In fact, what they want to say is zegt u het maar – the most currently used phrase to indicate that you can tell them what you want to order or buy. The phrase is: zegt u het maar. Also the word natuurlijk (means ‘of course’) is often pronounced as if it was something else, like ‘tulek‘. It could be an answer to your order or to your question if something is available. Ordering however, is quite simple. You say what you want and let it be followed by alstublieft (‘please’) or you first say Mag ik (means ‘Can I have’) plus the item you want (note that in phrases like this there’s often no ‘have’, just ‘Can I’ or ‘May I’ in Dutch). Een koffie en een thee, alstublieft. Nee, het spijt me, dat hebben we niet. The phrase Het spijt me means ‘Im deeply sorry’. In situations that are not very formal also the English word ‘sorry’ will do very well. The word Alstublieft is in fact the formal form (it contains u) – alsjeblieftis the informal version. These two do not only mean ‘please’: they also mean something like ‘here you are’ and are used when something is being given to you. A natural reply would be one of the phrases that mean ‘thank you’: dank u wel (formal), dank je wel (informal) or bedankt (can be used in formal and informal situations). The word wel is optional: it makes the same difference as ‘very much’ does in ‘thank you very much’. In letters you can also read things like hartelijk dank (‘profound thanks’) or dank u vriendelijk (‘thank you kindly’) but they are hardly ever used in spoken Dutch. In the first phrase in the first text – zegt u het maar – you also see one of those words that often occur in Dutch phrases without having a meaning. Or rather: they do have a meaning – if you look them up in the dictionary, you’ll find something, but it doesn’t apply in many phrases.The most frequently used are: maar (can mean ‘but’), eens (can mean ‘once’), even (can mean ‘shortly’) and hoor (can mean ‘hear’). To the first three you can often attribute the meaning of ‘just’ (zegt u het maar – ‘just you say it’) but that becomes hard when there’s two or three of them (kijk maar eens – ‘just look’). In general it’s best to state that if they do not represent their literal meaning, they are there to make a sentence friendlier and smoother. This doesn’t apply to the word ‘hoor’, however. This particular word really doesn’t have any meaning when it appears at the end of a sentence. It’s just there as an extra sound to be able to give the sentence the right intonation, which could be severe, ironic, angry, or whatever else the speaker wants to express. Here are some examples. Because these small words can have a subtle effect on the meaning, there’s an English phrase to indicate what’s being said. Like most western countries, in the Netherlands you will not be offered a lot to eat – on the contrary, the Dutch are very greedy on food. Older people in the Netherlands often have a special ritual concerning cookies: they take a bin with small cookies out of their cupboard to open it and offer you just one. After that, they close it and put it back in the cupboard. It’s very unusual to an opened bin on the table and it’s very unpolite to take anything to eat that is not explicitly presented to you. The Dutch are used drink loads of coffee, at any time. Sometimes they drink tee, though never with milk – if you’re used to milk in your tee, you explicitly have to ask for it, even in most restaurants. In their coffee they often pour some milk – they have special koffiemelkfor it. Text 4.4 – Kopje koffie? The last phrase means ‘something without alcohol, please’. The word graag is quite often used instead of alstublieft/alsjeblief, meaning ‘please’, but it can’t be used in a question.